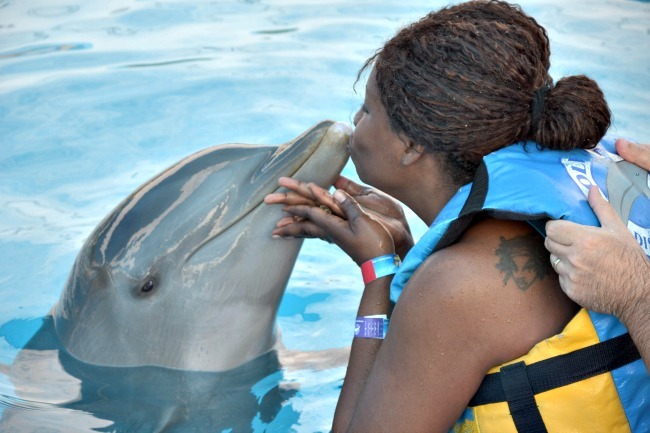 On my trip to Mexico earlier this month, I overcame my fears and swam with dolphins. Again. 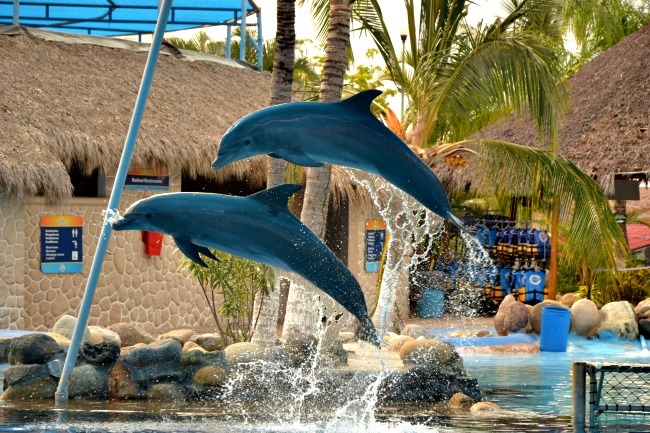 This time I did it in Puerto Vallarta at Dolphin Discovery, a place one could classify as an enrichment attraction – a marine education and amusement park. 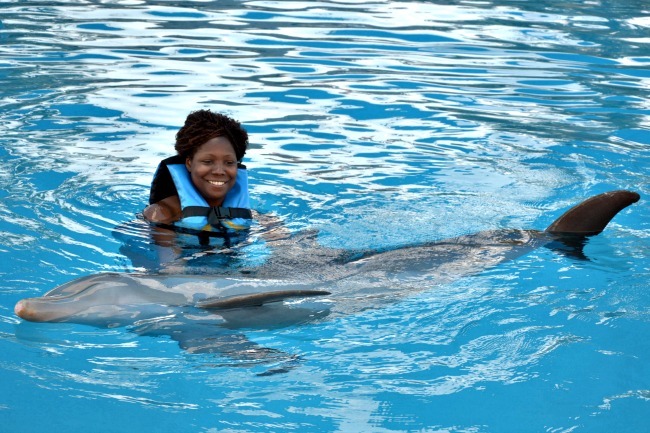 The first time that I swam with dolphins was three years ago in Jamaica. I remember the fear I felt beforehand and then my excitement afterwards. I couldn’t wait to get home and tell my family what I had done. It had only been five months since I’d even learned how to swim. My husband was shocked and my sister thought I was crazy. I was a new swimmer and not very fond of animals. However, dolphins are different. There’s something peaceful and magical about them. After an hour interacting with dolphins in a regulated facility like Dolphin Discovery, all fear dissipates and comfort sets in. You can tell that the dolphins are happy in their space. The trainers at Dolphin Discovery are short of amazing. You may enter the pool with apprehension but by the time the experience is over, you’ve forgotten about your fears. Their care and love for the animals that they work with is apparent. They’re proud of what they do. While our life-vest cloaked group stood chest deep in a warm salt water pool awaiting instructions, we watched two dolphins glide past us towards their trainer with calm precision. I thought to myself, this isn’t a place where I need to be afraid. The pool was the dolphins’ playground and they just wanted to have fun. 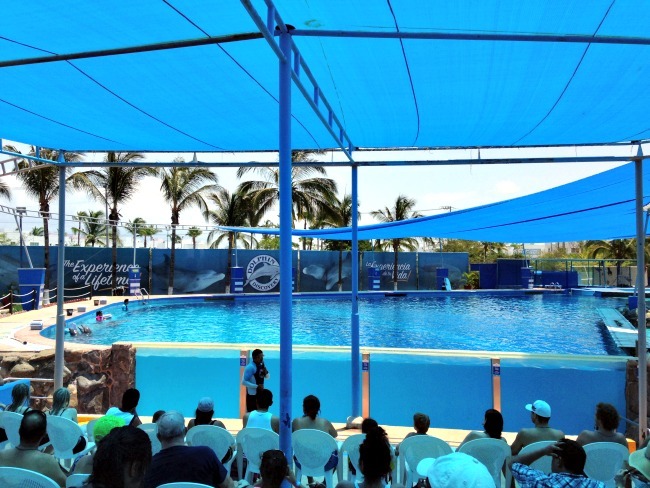 Our trainer Josè may have had trouble getting my name straight but he was on point with getting everyone relaxed and compliant with kissing, rubbing, holding and swimming with two of the facility’s dolphins. He showed us the various hand gestures we needed to use and was patient. One woman in our group refused to swim out in the pool to participate in one of the tricks. However, by the end, she was enjoying the moment in the middle of the pool with the rest of us. Jose’s methods were crafty and I quietly applauded him getting her to a relaxed place. Before stepping into the 18-foot pool, children and adults sit down for a 10-minute talk on marine life and environmental issues. The staff reiterates the importance of our actions as humans to protect the environment. This is what I like most about Dolphin Discovery – their messaging on global responsibility to guests young and old. Their three-word mantra, “Recycle, Reuse, and Reduce” can be heard throughout the day. 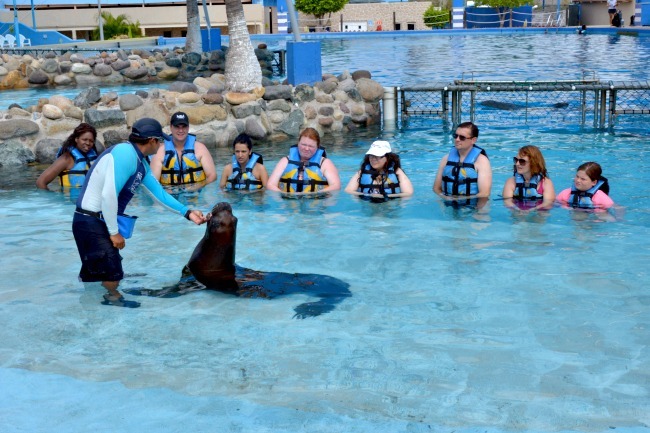 Getting a lesson on the difference between sea lions and seals. Spend a day at Dolphin Discovery with your kids and I’m certain that if you do the Royal Swim Experience, you will all leave informed and quite possibly changed. I gained a new appreciation for these beautiful marine mammals as well as the sea lions on the property. 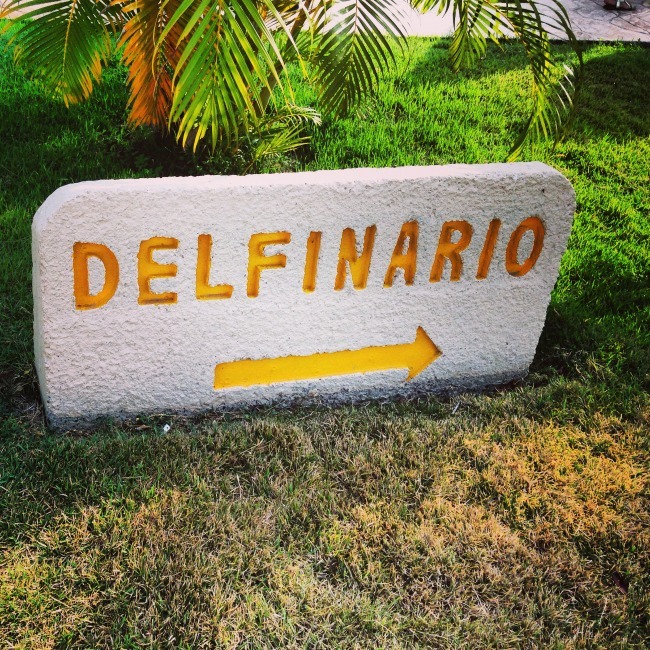 Como se dice “Dolphin’s home” en Español. 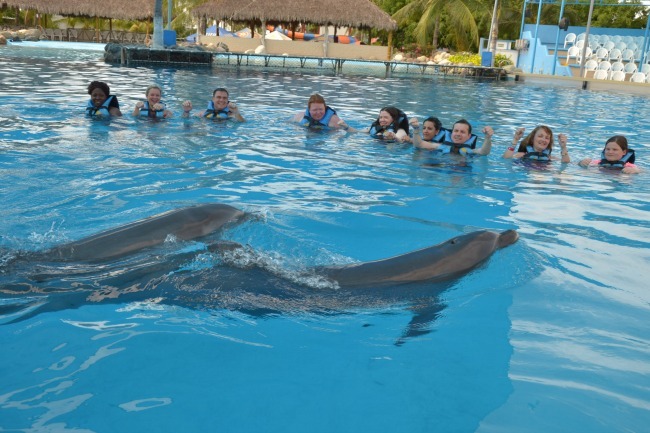 Dolphin Discovery is more than just about entertaining guests. It educates and leaves an impression on you as well. 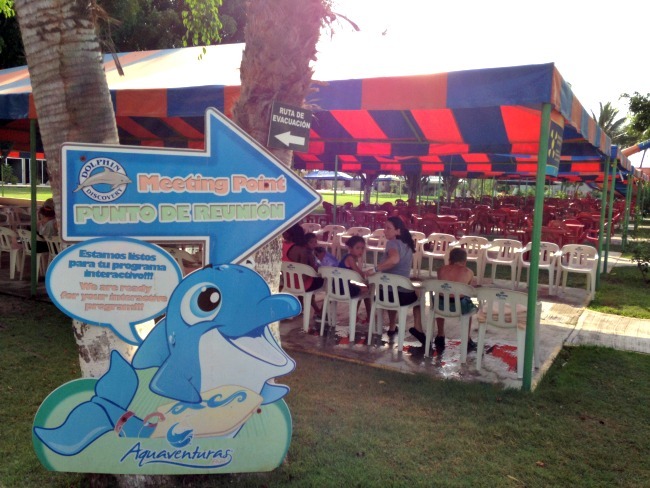 I was a guest of the Puerto Vallarta tourism board and Dolphin Discovery on this visit. All opinions expressed here within are my own.